A holy town with a beautiful history of so many years, Mathura is regarded as the hometown of Lord Krishna, most important god of Hindu Pantheon. It has several legends and myths to unfold to its devotees arriving from different parts of the globe. Mathura is a main center for Hindus and boasts of many attractions that will fascinate any bystander. Explore a magical place that has so much to tender to its visitors. Mathura is hailed as Muttara by British and Madoura by Greeks, the factual meaning of the word is a place of gods. Although the town is associated with myths and stories of the Lord Krishna, it is also served as a holy place to the Jainism and Buddhism. Moreover, devotees get to have a glimpse of the Krishna's life from his upbringing to grown up. 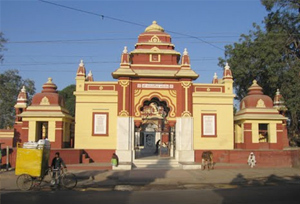 Gita Mandir: One of the most sought after destinations of India, Gita Mandir is a sacred temple in the city of Mathura. The shrine is decorated with a beautiful deity of Lord Krishna. It is erected by Birla group and devotees gather here during the fair of holi and Janmashtami. Jama Masjid: Built in 1661 by Nabir-Khan, Governor of the king Aurangzeb, Mathura is among the popular tourist attractions in Mathura. It offers an amazing appearance with its intricately ornamented four minarets. Located near the Janmabhoomi temple complex, the striking creation of the Jama Masjid forms a deep-rooted hunch on the mind. Potara Kund: Enveloped by shrines from all sides, Potara Kund can be reached by car, Bus and taxi all through the year. Visitors pay a visit to this holy temple from different parts of the globe to experience peace and harmony. Vishram Ghat: Enclosed by beautiful shrines like Radha - Damodar shrine, Langali Hanuman Shrine, Murli Manohar temple, Neelkantheshwar Shrine, Mukut Shrine and Yamuna - Krishna Shrine, Vishram Ghat should not be missed during the trip to Mathura. The place is associated with stories of Lord Krishna and the history has it that it was the place where lord had taken rest after slaughtering Kamsa. 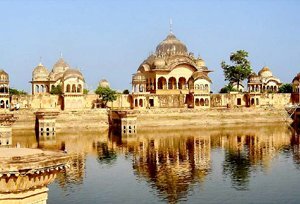 Kusum Sarovar: Positioned in proximity to Radha Kunj in the holy city of Mathura, Kusum Sarovar is deemed to be the site where Radha would meet Lord Krishna. It also includes rich flora and fauna and there is a Kadamba tree which is deemed to be much loved of Lord. One can also take a dip in the Sarovar to alleviate the worries and have a refreshing feeling. By Air: The closest airport to reach Mathura is Delhi international airport, around 147 km away. It is well connected with main cities of India and abroad. Taxis are also available from airport to make it to Mathura at nominal price. By Rail: Mathura railway junction is well connected to the main cities of India like Kolkata, Delhi, Mumbai, Chennai and many other places. By Road: Agra, Faizabad, Delhi, Allahabad and many other cities of India are well connected to Mathura by a good network of roads. Regular bus services are also available from the cities around Mathura.